Tech Crunch ran a story today about Evan Williams paying $7500 for the Twitter domain name back in mid 2006. @ev is the co-founder of Twitter. He’s tweeting with Ed Shahzade @ed. And some Twitter history from LA Times. Then when did the service’s name morph from “Status/Stat.us” to “twittr” to Twitter? We wanted to capture that in the name — we wanted to capture that feeling: the physical sensation that you’re buzzing your friend’s pocket. It’s like buzzing all over the world. So we did a bunch of name-storming, and we came up with the word “twitch,” because the phone kind of vibrates when it moves. But “twitch” is not a good product name because it doesn’t bring up the right imagery. So we looked in the dictionary for words around it, and we came across the word “twitter,” and it was just perfect. The definition was “a short burst of inconsequential information,” and “chirps from birds.” And that’s exactly what the product was. This was written by John Humphrey. Posted on Tuesday, September 14, 2010, at 3:49 pm. Filed under Domaining, Domains Are Brands. 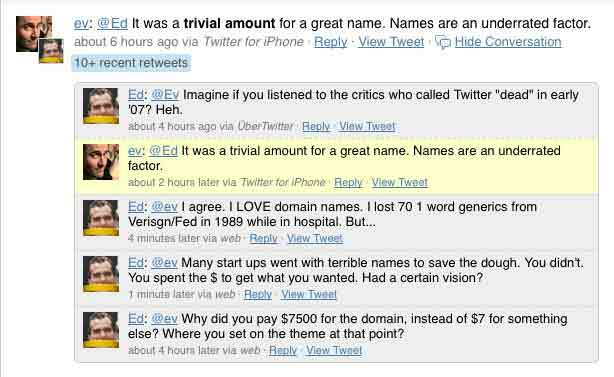 Tagged domain names, domains are brands, Evan Williams, Stat.us, trivial amount, Twitter, Twittr. Bookmark the permalink. Follow comments here with the RSS feed. Post a comment or leave a trackback. Hey, this is another case and point for us. 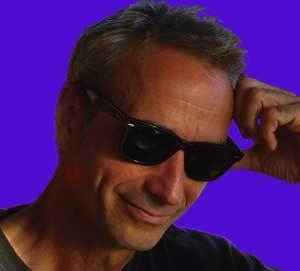 ‹ Singular Vs Plural Keyword Domain Names?